The Commission is proposing a new Justice, Rights and Values Fund, simplifying the existing programmes in this field. The fund comprises the Rights and Values, and Justice programmes. The Fund has a proposed budget allocation of 947 million EUR over the seven years, 642 million EUR for the Rights and Values programme and 305 million EUR for the Justice programme. The overall allocation is roughly equivalent to the previous period budget allocation. The Fund will support the activities of a number of actors in the field of rights and values such as NGOs, equality bodies, public administrations, judicial networks or universities. What are the changes to the current set-up? The creation of a Justice, Rights and Values Fund and its two underlying programmes represent a simplification as compared to the current situation of three programmes. In particular, the area of citizenship, which is dealt with currently by two different programmes, will be covered by the new Rights and Values programme only, which will allow developing synergies. 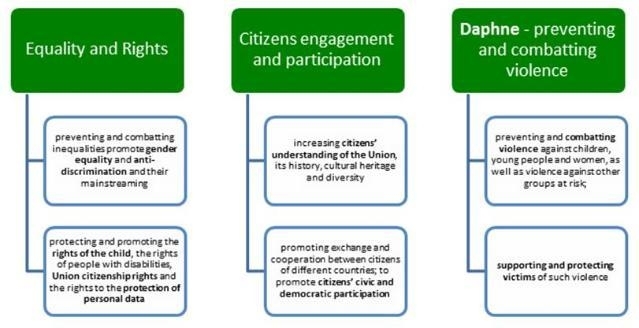 The Rights and Values programme aims at protecting and promoting rights and values as enshrined in the EU Treaties, including by supporting civil society organisations, in order to sustain open, democratic and inclusive societies. What sort of activities will be funded under the Rights and Values Programme? developing the capacity of European networks to promote and further develop Union law, policy goals and strategies as well as supporting civil society organisations active in the areas covered by the Programme. facilitate effective access to justice for all and effective redress; it will promote efficient civil and criminal procedures, promote and support the rights of victims of crime as well as the procedural rights of suspects and accused persons in criminal proceedings. What sort of activities will be funded under the Justice Programme? development and use of information and Communication Technology (ICT) to improve the efficiency of judicial systems and their cooperation and the cross-border interoperability of systems and applications. developing capacity of key European level networks as well as supporting civil society organisations active in the areas covered by the Programme. How will NGOs be supported? The role of Civil Society Organisations is very important for the implementation of the Justice Rights and Values Fund. In particular the Rights and Values programme will aim to protect and promote rights and values as enshrined in the EU Treaties, including by supporting civil society organisations, in order to sustain open, democratic and inclusive societies. It will fund NGOs to promote activities under its three specific objectives, in continuity with the current practice. This includes for instance projects to fight violence against women, to promote the rights of the child or remembrance projects. The programme will also fund activities to encourage and facilitate active participation in the construction of a more democratic Union as well as awareness of rights and values through support to civil society organisations, including NGOs and think tanks. In addition, the Justice Programme will also support civil society organisations, for instance to facilitate effective access to justice for all. How does the Fund relate to the new mechanism the Commission proposed on rule of law in the Multi Annual Financial Framework? The proposed Regulation equips the Union to better protect its budget when weaknesses in the rule of law impair – or threaten to impair – sound financial management or the financial interests of the Union. The role of the Fund is different, it is to promote policies in line with fundamental rights and European values. It will further support the development of a European Area of Justice based on the rule of law and mutual trust and ensure people can enjoy their rights.